Here’s Your First Look at Evangeline Lilly’s Wasp Costume! We now have our first look at what Evangeline Lilly’s Hope Van Dyne will look like as the Wasp come next year! Peyton Reed’s Ant-Man was a complete surprise when it come to the superhero genre, as the film came over incredible odds to finish where it was at. But while we were all very happy with Paul Rudd as the character, Michael Douglass’ role, and the approach the film took to the genre, one of the most exciting aspects of the film was it’s ending, where Douglass’ Pym revealed to his daughter (Lilly’s Van Dyne) that she was always destined to take over her mother’s mantle as the Wasp. Disney’s big D23 Expo is this weekend, where we’ll no doubt be getting a ton of juicy tis bits on not just Disney properties, but everything Marvel as well. Marvel will be at next weekend’s San Diego Comic Con, where they will have a 90 minute panel, but being that it’s Marvel’s parent company’s own Expo, we’re expecting some cool new stuff in the next few days. 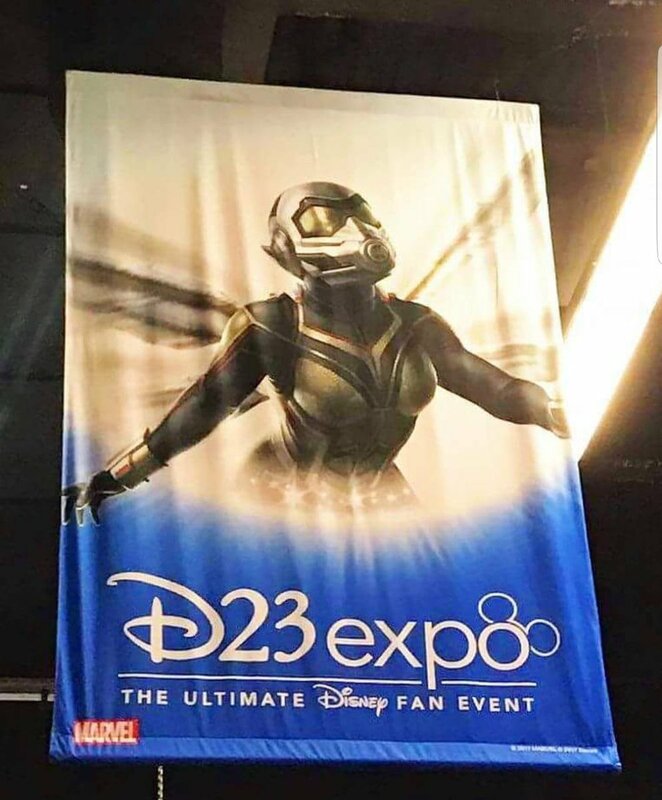 And as a little preview, during set up, Evangeline Lilly herself revealed to us fans a banner that will be flying high this weekend, a banner which gives us fans our first look at the Wasp. I totally dig the costume. Now it’s worth mentioning that the banner does feature a concept art image, which doesn’t necessarily mean it’s the finally outline. That may be why it looks a bit different from what we saw during the mid-credit scene of Ant-Man, but that’s not a bad thing. As we’ve seen in the MCU thus far, costumes go through multiple variations. Hell, Ant-Man has had a solo movie and a small role in Civil War and he’s already on his second version. I’m just excited to see this character in action. Lilly is one of my favorite actresses, all the way back to her days on Lost. She’s incredibly underrated and now that she finally gets her time to shine in this kind of role opposite some of the biggest names and character in the business, it’s pretty damn awesome. As for the character of the Wasp, she is personally one of my favorite Marvel characters. Not only is she a founding member of the Avengers, but she always sticks to her guns and completely believes in what she is doing. Now, that’s the Janet Van Dyne character, Hope’s mother. We got a glimpse of who Hope was in Ant-Man, but never under the eyes of a name like the Wasp. It’ll be interesting going forward to see how Marvel portrays her. Will she be similar to who she was in Ant-Man? Will she evolve into something more, just as Scott did. Or, is Marvel going to reinvent the comic version of the Wasp in Hope? Any of those work, let’s just hope it’s not just done correctly, but fits the overall story. Because if it does, Evangeline Lilly and her character could be a major player in the MCU for years to come. Ant-Man and the Wasp flies into theaters on July 6th, 2018.